Rohtang Pass (Bhoti: Rohtang , lit: pile of corpses, due to people dying in bad weather trying to cross the pass) (altitude 3,978 m or 13,051 ft), is a high mountain pass on the eastern Pir Panjal Range of the Himalayas around 51 km (32 mi) from Manali. It connects the Kullu Valley with the Lahaul and Spiti Valleys of Himachal Pradesh, India. Manali-Leh Highway, a part of NH 21, transverses Rohtang Pass. The pass is open from May to November. It is not particularly high or difficult to cross on foot by Himalayan standards, but it has a well-deserved reputation for being dangerous because of unpredictable snowstorms and blizzards. This pass is an ancient trade route between the people on either side of Pir Panjal. The local name for this pass is a generic name of pass. 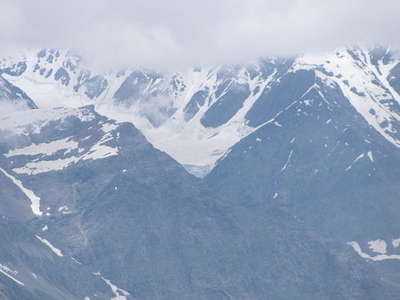 There are many other passes in Lahaul and Spiti which have specific names (Kunzam La, Baralacha La, etc.). This is suggestive of the fact that this must have been the oldest and most frequented pass in the region, or the fact that it is the main pass leading from one cultural region to another, quite different one, to the north. National Highway 21 (NH 21), the road through the Kullu Valley, past Manali and over the Rohtang Pass to Keylong, and Lahul and on to Leh in Ladakh, has become very busy during the summer months as an alternate military route, following the Kargil Conflict in 1999 in addition to tensions in Kashmir. Traffic jams are common as military vehicles, trucks, and goods carriers try to navigate the tight roads and rough terrain, compounded by snow and ice at certain points and the large number of tourists vehicles. 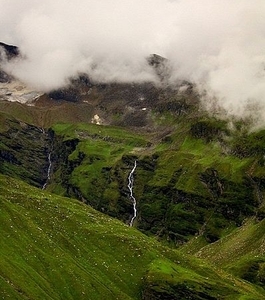 Unknown Waterfall on the way to Rohtang. Several episodes of the History Channel's Ice Road Truckers series spinoff IRT Deadliest Roads dealt with truckers crossing the Rohtang Pass to deliver supplies. Due to the military significance of the highway and the need to keep it open the entire year, the Indian government began building the $320 million 8.5 km (5.3 mi) long Rohtang Tunnel in 2010 to bypass Rohtang pass for creating a much safer and faster year-around link to Keylong, Lahaul and Spiti and Leh in Ladakh. The tunnel will also shorten the distance by about 50 km (31 mi) and reduce the travel time between the southern and northern faces of Rohtang pass by five hours. While it now takes 4 to 6 hours to ascend, negotiate and descend the Rohtang pass, it will take only about 30 minutes to travel through the Rohtang tunnel. Here's the our members favorite photos of "Mountain Passes near Pir Panjal Range". 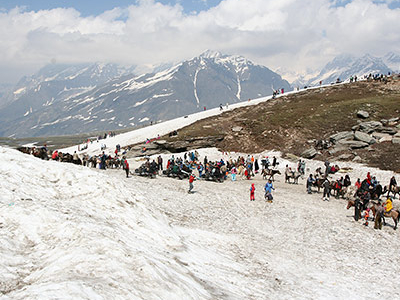 Upload your photo of Rohtang Pass! Get in touch with 23 Touristlink members who want to visit Rohtang Pass or with Vizagexecutives Raman, World Yatra and 43 others who already have been here.